The Cameo is not your normal fireplace. It boasts an unusual round design that includes many features traditionally only found in a larger selection. By eschewing the traditional mantel shelf the Cameo is able to fit into either a large or small room while retaining its natural character. This is a bold style that catches the eye and bestows a striking quality to any room. 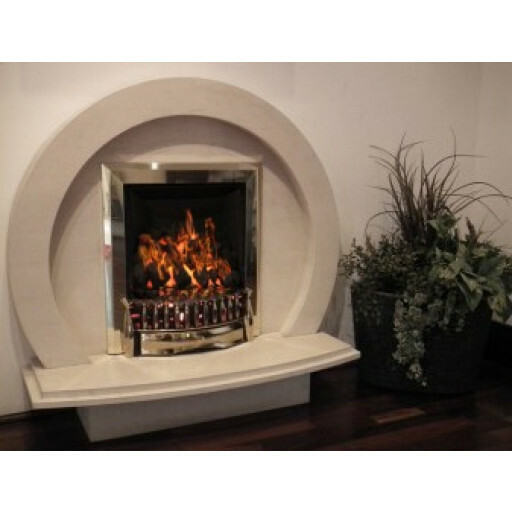 This fireplace uses high quality micro marble which is very resilient and stands up to heavy use. It is also offered in limestone for a more rustic appearance. Either material is perfectly suited to bring out the inherent beauty of the Cameo. The shape and design of The Cameo Fuentes marble fireplace brings a modern sense of occasion to any room it is installed within. It is the perfect backdrop to homes of any size and décor. This fireplace will enhance not only the décor of your home, but is also a functional source of heat for years to come. I was struggling to find something a bit art deco for my room but saw this and it just fit the bill. Its not everyones cup of tea but it was just what I was looking for. It looks amazing fitted.